In my first post under the above heading, I blogged about a sage-cream sauce and provided an Ina Gartin technique for roasting chicken breasts that I really like. I would like for you now to see what I do with the extra roasted chicken breasts. And, it is an easy way to go for a gourmet main course, of course! In a large skillet, heat the oil and butter and sauté onion and mushrooms, stirring occasionally, until the liquid the mushrooms give off is evaporated. Add Marsala and cook mixture, stirring, until Marsala is almost evaporated. Add broth and simmer until you have a little over 1/2 cup. Add your pre-roasted chicken with any juices that have accumulated and simmer, turning chicken once, until chicken is warmed through . Transfer chicken with tongs to a platter. 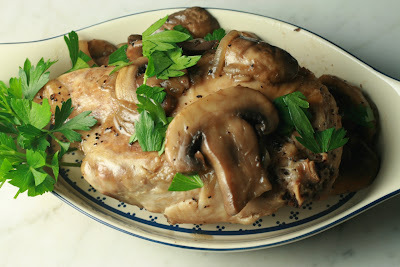 Simmer mushroom sauce until liquid is reduced to about 1/2 cup. Remove skillet from heat and stir in the remaining tablespoon of butter and adjust seasoning if needed. 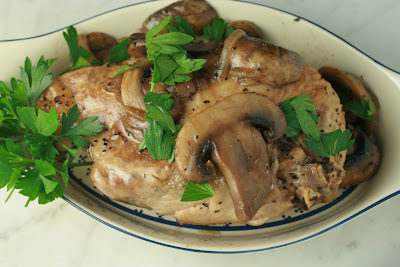 Spoon mushroom sauce over and around the chicken breasts and sprinkle with parsley.